Do you ever crave Greek food, but don't have the time to seek out a sit down restaurant? Souvlaki Bar in Alexandria is the perfect answer to your problems. It's a casual, counter-order style joint that serves great Greek cuisine to the masses. It's affordable, too, with most items costing less than $10. Souvlaki Bar offers tons of Greek classics like gyros, souvlaki (of course! ), and assorted dips like hummus. It's great for quick takeout, or you can have a seat and eat in. Parking isn't hard to come by, with a small lot in the back plus plenty of street parking. 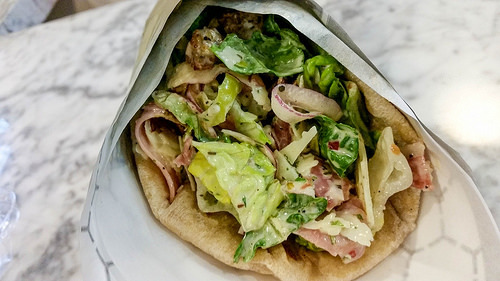 Souvlaki Bar just opened recently, so you should definitely head over soon before the secret's out!